Quality hand painted frames decorated with hearts an flowers. 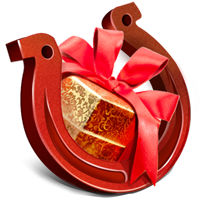 AKVIS Frame 2.5 Saint Valentine Frame Pack was available as a giveaway on February 14, 2018! AKVIS Frames program lets you apply ready to use frames created by artists specially for AKVIS. Some frames are included in the program and available in the Default Pack. You can also purchase extra theme frame packs, each set is designed for a specific topic, for example: four seasons sets, packs related to hobbies, special event sets like Christmas, Wedding, Valentine, Communion, Halloween... and many others! 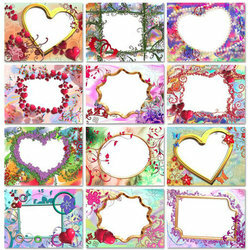 The Saint Valentine Pack includes 50 high quality hand painted frames decorated with hearts and flowers! 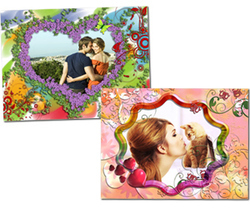 These amazing ready to use frames are sure to bring warmth to your most special photos. The happiest moment of your life need beautifully designed frames! You can use these templates to frame your wedding anniversary photos or prepare a Valentine's day gift. How would you improve AKVIS Frame 2.5 Saint Valentine Frame Pack? Get 3-Month Subscription for FREE! - Free upgrades during 3 months. - The promo is valid on February 14-17, 2018. AliveColors is all-in-one image editor. It offers a wide range of tools, adjustments, filters, and multiple effects, taking your photographs to the next level. Basic functionality, only for non-commercial use. Get AliveColors Pro 50% Off! - Full functionality, commercial use is allowed! - Lifetime license! Includes 1 year of free updates. - Activation on 2 computers. - The discount is valid until February 20, 2018. AliveColors is all-in-one image editor. It offers a wide range of tools, adjustments, filters, and multiple effects, taking your photographs to the next level. Get Four AKVIS Frame Packs 30% Off! You will get 4 Lifetime licenses. Commercial use is allowed! The discount is valid until February 20, 2018. 4 AKVIS frame packs: Winter + Spring + Summer + Autumn. Each pack includes 50 ready to use frames of super quality. Enjoy all Four Seasons with colorful AKVIS frames! Get Sketch Deluxe 15% Off! - Full functionality. Only for non-commercial use. AKVIS Sketch is the number one photo to drawing conversion software. You can imitate the technique of graphite or color pencil, charcoal or watercolor painting or even seamlessly combine photography and drawing to bring a fresh viewpoint into ordinary scenes. Get Refocus Deluxe 15% Off! AKVIS Refocus is a powerful tool that improves clarity of any photo recovering lost image detail and applies various blur effects. 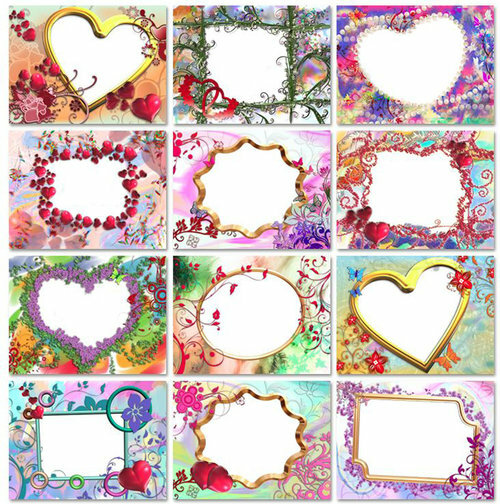 Quality hand painted frames decorated with hearts an flowers. What's with the "an" rather than "and"? I'll pass just because of this. Unprofessional. Registration/Activation was a bit tricky, but finally accomplished by re- re- re-reading the directions and following through. I enjoy programs like these for the occasional times when I'm looking for some oomph with my photo presentations, but I think this would be almost essential for scrapbookers! Anyway, thank you to AKVIS and GAOTD. A total waste of time. Downloaded, unzipped and installed (apparently) OK on my Win 7 Pro system. An "Activation" screen immediately came up after double-clicking setup.exe file. NO serial number required - just name and email address - actual Frames program appeared to install OK. Then went to the URL in the readme file to obtain an "activation key" for the Valentine's Day frames. That went OK too - just entered my name and email address and within a minute, I had an email from AKVIS with the "serial number" for the Valentine Pack. Tried to use the Valentine frames per instructions in the readme file - used BOTH methods indicated - both times, there was NO valentine pack available. Next looked at my download folder and found a ValentinePack.zip file there which apparently was created by the setup.exe file. Double-clicked THAT zip file only to get a "enter password" dialog box for the zip file. Did NOT receive any "password" so tried to use the serial number that was previously sent - that didn't work - said "invalid password". What a convoluted procedure that doesn't even work. A total waste of time. Seems a shame since the frames themselves appear to be above average in quality and I would have liked to actually try them. I open the program, on the right side .. there is a tab saying "FRAME Pack Manger" Click it choose the Saint Valentine Frame Pack, , click download right there , when its done , activate . and the pack is there .. ready to use. hope this help. I'm not downloading, because I wouldn't use a program like this, but did you go to the page in the instructions link posted above? (https://akvis.com/en/frames-tutorial/howwork/frames-set-registration.php) I don't know what the readme file says, but the page has very specific instructions for how to install and activate and add the packages. For example, it says, "Copy the .zip file (do NOT open it!) to a folder selected in program's preferences.Attention! Do NOT open the .zip file yourself. Just copy it to a folder. It can only be loaded by the AKVIS program." It sounds like you tried to unzip it. Maybe that is the problem? Eric, I'm not downloading, because I wouldn't use a program like this, but did you go to the page in the instructions link posted above? (https://akvis.com/en/frames-tutorial/howwork/frames-set-registration.php) I don't know what the readme file says, but the page has very specific instructions for how to install and activate and add the packages. For example, it says, "Copy the .zip file (do NOT open it!) to a folder selected in program's preferences.Attention! Do NOT open the .zip file yourself. Just copy it to a folder. It can only be loaded by the AKVIS program." It sounds like you tried to unzip it. Maybe that is the problem? abc, Thank you too - Appreciate the help. Yes, I **DID** try to unzip the file manually. Have you tried a different email provider? Sometimes it helps to do so. Just an idea. d burgess, Have you tried a different email provider? Sometimes it helps to do so. Just an idea. d burgess, You don't give any clues. And give this button a page, so you can login on FB and also a link to fill in you mail-address. Or give the downloadbutton a link for download? One nice promotion associated with today's Giveaway is the offer of a 2 computer license of their graphic program Alive Colors for 50% off. The offer is valid for 1 week. This offer is worth a look because the program includes SOME of their excellent filters built in as well as some of their excellent EFFECTS (depending upon version). It is definitely worth a look. Is the program really free? You decide. They offer one free frame pack which is too late to use but if you want more you have to pay for them. If they are only offering one free pack then they should have given the option of choosing your own. I'll pass any time a carrot is dangled in front of me. These frame-makers are of absolutely no interest to me - no matter who makes them! Still, I must say that Akvis software is of the highest standard and I have bought and used them for years now. The company always responds to inquiries. These frame-makers are of absolutely no interest to me - no matter who makes them! Still, I must say that Akvis software is of the highest standard and I have bought and used them for years now. The company always responds to inquiries. A few too many hoops to jump through to activate a mere 13 dollar program that is too late for this Valentines Day anyhow. A few too many hoops to jump through to activate a mere 13 dollar program that is too late for this Valentines Day anyhow. Not worth the effort.